Is your facility in need of general ventilation? Do you have exhaust fans at the ceiling or upper walls wasting lots of energy? If you were frustrated with this winter’s heating bills, start planning now for saving energy next winter. The main reason for installing fans or ventilation is to protect the employees from harmful fumes. No one should have to breathe contaminated air while in the workplace. All people just want to feel good mentally and physically. Giving your employees the opportunity to breathe some fresh air on a daily basis is crucial. In that respect this system is like no other. We will exhaust the bad air and save lots of heat in the process. This will allow wall fans to be turned off saving heat also. The welding smoke and diesel fumes, CO, mist and haze, tend to naturally rise to the ceiling and hang in the air. Do you agree? What we do is create the perfect air movement in the shop. The Keep the Heat™ Air-To-Air Heat Exchanger is a commercial heat recovery ventilation system that consists of small tubes within a larger enclosure, that’s where the heat exchange takes place. The heat exchanger is placed just under the roof where the heat accumulates. The system draws fresh air from the outside and forces that air into eleven three-inch tubes. Those tubes are nested in the larger enclosure. When those eleven tubes exit the large enclosure we route those tubes across the ceiling and down the sidewalls and deliver the fresh air down to about three feet from the floor. It draws your exhaust air into the open end of the large enclosure and that air warms the tubes as it is blown outside. As the old air is leaving, it heats the new air coming in. All the stratified waste heat at the ceiling will be utilized to heat the incoming air bringing this heat to the floor level. The design of the Keep the Heat™ creates the ideal air movements to protect the employee’s health. We are only concerned with the lower half of the building where the employees work. We like to reference this area as the breathing zone. This constant airflow from floor to ceiling is vital for keeping the employees work areas healthy, fresh, and warmer. For full details on the Keep the Heat™ System, download our PDF on-line brochure to the right. Energy Savings!!! By utilizing efficient heat recovery. You actually recover and reuse the heat you’ve already paid for! Low Maintenance and Operating Costs. There are very few moving parts, only two motors that have sealed bearings, and there are no expensive filters to change. 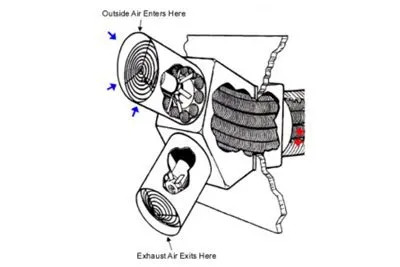 Efficient Exhaust of Contaminated Air. Helps maintain proper Oxygen levels in welding areas where gases such as argon and CO2 are present. The system also removes odors and humidity Without losing heat through existing exhaust fans. Extended Life of your Heating Equipment.. Heating equipment in an environment that is harsh will burn the particulates in the air creating alkalis or acids that eat away at your equipment’s heat exchanger shortening its life. Fresh Air Delivery to employees at floor level. Very little Building Construction Necessary The system only requires a wall opening that is 21 1/2″ by 22 1/2″ and does not require much structural support. The system can also be used in the summer by exhausting excess heat at the ceiling, with an added summer benefit of bringing cool night air into your shop when the facility is closed. Because fresh air is pumped in, the stagnant air is forced out. The Keep the Heat™ system removes stale stagnant air from problem areas all over your shop. Removing contaminants such as welding smoke, and diesel smoke, effectively ending smoke haze complaints. The system also removes dangerous Carbon Monoxide, odors, and humidity. The system also removes dust creating cleaner and fresher offices. Who uses this unit? …. Anybody that wants ventilation without losing heat. When using a VFD controller no starter is required The VFD has its own protection.